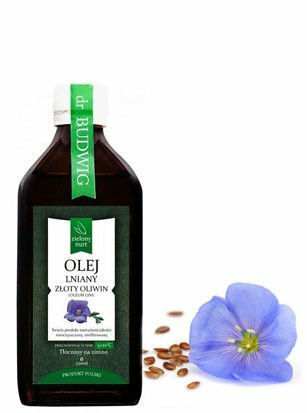 Especially recommended for Dr. Budwig diet flaxseed oil embossed with a carefully selected blend of varieties of flax grown in Poland, raised by natural selection with a very high content of essential fatty acids Omega-3 up to 60%.It is characterized by an exceptionally mild taste with a slight hint of nutty sesame, without the so-called fish aftertaste found in linseed oil produced from the seeds of brown. 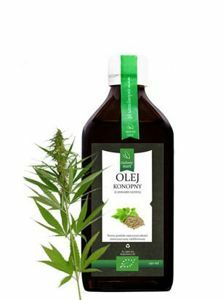 In its biochemical composition contains up to 60% fatty acids Omega-3 family of essential fatty acids, which are responsible in large part for our health. The absence of omega-3 in the diet may lead to a decrease in resistance, heart disease and cancer, muscle pain, Alzheimer's disease, and diseases associated with intestinal motility. The unique technology of cold stamping to 40°C and the storage and distribution of up to 12°C ensures to minimize the risk of oxidation or oxidation of the fatty acid Omega-3, and thus guarantees the highest quality and the content of fatty acids Omega-3. Only fresh and unoxidized Linseed Oil "Gold Peridot" stored under refrigeration has health benefits. Take the chance to be healthy. 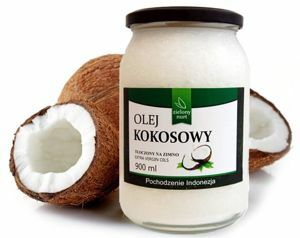 Coconut Oil 900ml NOW 10% OFF!